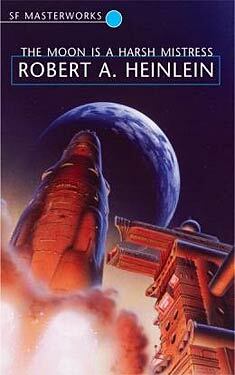 Until now I had never read any Robert Heinlein. I’m not sure why; he seems to be considered by some to be a key writer in the history of SF. Lord knows that, as a teenager, I read a load of less well remembered novels by the likes of Clifford D. Simak. The Moon is a Harsh Mistress follows the planning, execution and aftermath of a rebellion by the inhabitants of a future lunar colony. More than this, though, Heinlein’s novel is an examination of libertarian political ideals. Though “examination” perhaps gives it a little more credit than it deserves. Actually, reading this back and thinking further about the novel, there’s really not much else to say about the story itself. I had a few problems with the novel. Granted, I’m not – despite being socially liberal – in any danger of being described as a libertarian, which possibly sets me up to dislike the novel before I start. I’d like to think that I’m a better reader than that, though. I’ve read plenty of fiction by authors with whom I’m sure I’d find little common ground and yet still enjoyed their writing. My main problem lies not with the politics of the novel per se, rather the way that Heinlein puts the ideas across. There is a lack of subtlety to both the ideas themselves and their communication which quickly killed any enjoyment that I may have derived from the novel. The lunar colony in the novel is made up mainly of the descendants of criminals who’d been transported their for their heinous crimes and are no longer able to return to earth, due to the physiological changes that they’ve undergone under the lower gravity of the moon. Heinlein’s lunar colony feels less like a society of three million people and more like a petri dish, where the author has removed any inconvenient variables which would impact upon the experiment he is conducting. Often people are criticised for making the mistake of believing that Heinlein is expressing his own views through his fiction and that there is enough variation within his novels to demonstrate that he is conducting thought experiments and that he doesn’t necessarily hold with the ideas within. Unfortunately, as noted before, I’m not at all familiar with his work, so I have no idea how fair this is. What I do know is this: the politics are not so much written large as scrawled across a jotter with a fat green crayon. Regardless of whether or not Heinlein believed everything he wrote in this novel (and I’ve seen enough quotes from him to suggest that he at least had sympathies with these kinds of ideas) it is just not a particularly good book. Interestingly I’ve seen a similar complaint attributed to him as was attributed to Ayn Rand (namely that they didn’t regard themselves as being libertarians). In fact, as well as referencing historical revolutions, revolutionaries (notably the American Revolution), Heinlein makes an overt reference to Ayn Rand’s Atlas Shrugged, by suggesting that they need to find their own John Galt. Not that I’ve actually read Atlas Shrugged. If I ever manage to read every other book ever printed, then, and only if I’m feeling particularly masochistic, I may give it a try. The lunar colony doesn’t seem to me to be a particularly realistic depiction of a functioning society. It seems to be modelled on the (mythical?) wild west. People are kept in check mostly by natural law. Good manners are essential as an unpleasant death is merely an open airlock away. The inhabitants of the colony work to grow wheat, which is then transported to the earth, at apparently unjust terms. Meanwhile, they are ruled by the Authority, an extension of the Federated Nations (F.N. ), which seems to be a thinly veiled derogatory depiction of the United Nations. They plot a revolution, designed as they see it to restore liberty to the people. Now, anybody who knows me, is probably aware that I am critical of your actual state tyranny. However, the focus of The Moon is a Harsh Mistress seems to be primarily on what they regard as an economic tyranny. Thus, they are concerned with issues such as – what they consider to be – over large government and taxation. This is, I suppose, a reasonable course to plot in light of the comparisons to the American revolution. Once again, while I despair at the currently regressive taxation system that we have, the view taken in this novel is essentially one of “no, it are MY moneys!” Similarly, the view that government is a necessary evil, with emphasis on the evil seems a little simplistic, and destroys any impact that the novel may have. “Distrust the obvious, suspect the traditional…for in the past mankind has not done well when saddling itself with governments…. I note one proposal to make this congress a two house body. Excellent–the more impediments to legislation the better. But, instead of following tradition, I suggest one house of legislators, another whose single duty is to repeal laws. let the legislators pass laws only with a two-thirds majority….while the repealers are able to cancel any law through a mere one-third majority. Preposterous? Think about it. If a bill is so poor that it cannot command two thirds of your consents, is it not likely that it would make a poor law? And if a law is disliked by as many as one third is it not likely that you would be better off without it? There’s a lot of this in the novel and while you are free to hold such views – which I should stress a good thing even if I don’t necessarily hold with them – it is irritating that the Prof is portrayed as the hyper-rational (though he does latterly admit to a degree of hypocrisy) character while trotting out this kind of in-an-ideal-world speechifying. Of course, the revolution succeeds (and not at all in a satisfactory manner; Heinlein, as noted earlier, stacks the deck with his frontier land and, further, the brilliance of and they can get to work crafting their utopia, with the voice of the computer and the lumbering, idiotic nations of the F.N.) and they can go about creating their utopia. This, unfortunately, involves tedious screeds from the Prof on the evils of government. The novel is chock full of this stuff, and it quickly becomes tiresome, lacking, as it is, any subtlety. The third part The Moon is a Harsh Mistress is titled “TANSTAAFL” which is, of course, the acronym for the phrase popularised by economist Milton Friedmann “there ain’t no such thing as a free lunch.” I’ve never liked that phrase when used by economists of Friedmann’s ilk. It’s, while not quite so irritatingly-down-home-folksy as the assertion that running a national economy is comparable to running your household budget, it is an astoundingly glib phrase. Heinlein uses a pidgin form of English which has incorporated, amongst other languages, Russian words (and, I believe, grammar) and slang from, I think, non-American English speaking nations. Once again, I imagine that this is to illustrate the diversity of those transported to the colony. This technique is not unique to Heinlein, of course. I have covered novels which use pidgins and creoles which exist in the real world and have also made reference to other novels which invent their own variations of an imagined future English. Generally, I have enjoyed it when an author has employed this technique. Unfortunately, Mannie’s Luna-speak didn’t work particularly well for me, where Nadsat in A Clockwork Orange was evocative and fitted the world created by Burgess, I just felt it made Mannie sound a little more simple than I think he was supposed to be. This feeling came after the simplistic portrayal of the political ideas had really started to grate on me, so I may be being unfair on Heinlein here. The other thing, which was even more distasteful was Heinlein’s dubious sexual politics in the novel. There are women in it though with the exception, perhaps, of Wyoh, they certainly are not in to the fore. The colony has a huge demographic problem. Men outnumber women by 2 to 1. This does give women a certain clout within society, but it’s (again) a childish reverence for them. They are almost worshipped, yes, but it’s for their baby-making abilities, rather than anything else. This is, oddly, despite Heinlein on the odd occasion going out of his way to make it clear that they (shock!) can be the equal of men. More troubling is an apparent predilection for young flesh – children are married into the polygamous relationships in their early years. Before I read this, I was somewhat embarrassed that I was so unfamiliar with an author who was apparently so well-regarded by many of his contemporaries and fandom. Now… I’m not so sure that I should have been. I didn’t feel that this had any appreciable influence on any of the novels that I enjoy and hold in high esteem (not necessarily, I should stress, none). I’ve read a fair proportion of the novels included in the Gollancz SF Masterworks series and, bearing in mind that there are a number that one would really struggle to classify as being genuine Masterworks, this is probably my least favourite (thus far). I won’t be in any particular rush to read any more Heinlein novels. This entry was posted in Review and tagged novel, robert a heinlein. Bookmark the permalink. How old are you? Did you grow up in the 60’s. Seems you have a tenor to your writing that doesn’t actually get Heinlein, or thos great writers of or age. Wonder if you grew up on Transformers? If so, that is fine,but, it is nice, from a literature point of view, “Amazing Stories”, etc, to not dismiss out of hand those visions of those imaginary writers who came before. As I respect those of the future. All a time stream. Thanks. One more question? I like that you are taking the time to read RAH. I see that you’re not familiar, as you are younger. Be aware, please, that a lot of us came up through the space program and before, with lots of this. So, aware of the adventures ahead of humankind, welcome your suggestions. A lot of these seem sorta silly, as our technology, science, and engineering have moved beyond. Please, tell use what you think the future brings, and how are you training yourself to meet your visions? Hi, David. Thanks for taking the time to read and comment. You’d be correct in noting that I am not of a generation that would have read this stuff when it came out. Having said that, I spent plenty of time reading the likes of (say) Clarke and Asimov when I was a boy. The latter doesn’t really support re-reading; neither does Clarke, possibly, but I don’t find his prose quite so noisome and still have a soft spot for him. Heinlein just didn’t, for some reason, register with me. I understand that when this and some of his other work was initially published it would have seemed a lot fresher than it does to my eyes. That is absolutely fine. I can only read it as someone who is aware of the reputation that Heinlein has as a great, though. Unfortunately, I found this work wanting and would certainly question the need of people new to the genre to read it. There was better stuff at the time and, without question, since. I don’t know that I’m dismissing him out of hand, though? I didn’t like the characters, the prose, the plotting, the politics and (most pertinently) the handling of the politics and the sexual politics. It’s not even that I don’t share Henlein’s view of the world (and I give thanks that I do not). I’ve read and enjoyed plenty of work by authors whose politics I don’t share. I’m happy to read work which deals with ideas with which I don’t hold or even find repugnant. After all, this is fiction; it is possible to write a novel which explores ideas that you yourself don’t hold. Rather, my problem is the way that he presents the ideas in this novel is deeply unsatisfying. Although calling a section TANSTAAFL isn’t likely to endear you to me unless you do something astounding with it. I don’t have a problem with SF that has been rendered obsolete by advances in technology, or any changes in the world. It always raises a smile when reading Clarke’s short stories to see British astronauts alongside Russians and Americans (and of course, more recently, the end of the Soviet Union at a stroke ended the idea that the cold war would still be going on in space). Anyway, must dash; thanks again for reading. It’s too bad that this was your first exposure to Heinlein — there was a survivalist streak in his writing that probably peaks in this novel. If you didn’t like “The Moon is a Harsh Mistress”, you’d hate “If This Goes On”, and “Farnham’s Freehold”. His masterpiece novel was “Stranger in a Strange Land”, which significantly influenced pop culture during the hippie era of the late 1960s. But it was his short stories decades earlier that are really worthwhile. Unforgettable mind-benders like “He built a crooked house” – a Ballardian piece of architecture that somehow exists in four spatial dimensions, or “All you zombies” in which all the self-referential time travel paradoxes are fully closed off, unlike stories like Doctor Who’s “The Five Doctors” that merely swirl around and diverge again. Or the epic Future History timeline encompassing 21 stories written between 1939 and 1957, compiled into “The Past Through Tomorrow”. But you’d be well-off avoiding Heinlein’s later novels, which became verbose, uninspiring, and curmudgeonly, not unlike Asimov in his “The Sensuous Dirty Old Man” age. I suspect you will discover that you’ve read some RAH and not registered the name. He was an astonishingly varied writer and wrote a lot. Just one correction: women’s aren’t valued for being babymakers alone. Wyoh is actually sterile after having a deformed child. What they are valued for is being family makers in a world in which the family is pretty much the only welfare system. I’d also note one thing you missed: this is a novel with a disabled protagonist. Manny has one arm missing and it really does matter at one point. Otherwise seems a reasonable take. I love Heinlein but sixty years or so is a pretty damn good run, and if he is wearing out, so be it. He has, however, left his prints all over the genre in both action and reaction. A very different novel you might want to try is The Door into Summer.